Go underground, back in time, or through a bison range with Minnesota state park tours! These tours are an excellent opportunity to learn more about Minnesota state parks and see unique and beautiful sights. Purchase a vehicle permit today and get a year of unlimited visits to all of Minnesota's state parks and recreation areas. Make reservations for Mystery Cave, Soudan Underground Mine, or a Prairie and Bison Tour online or by calling 866-857-2757. To reserve a Hill Annex Mine tour, contact park staff at Scenic State Park: 218-743-3362. All tours are available seasonally, visit individual tour pages for more details. 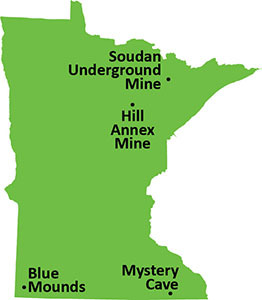 Underground tours of the state's last and deepest underground mine in Minnesota. See cave formations, underground pools, and dramatically lit corridors in Minnesota's longest cave. Step back in time! Hunt for fossils and follow the route miners took to this old open-pit iron ore mine. A one of a kind tour where you can experience the sights and smells of the prairie and bison.